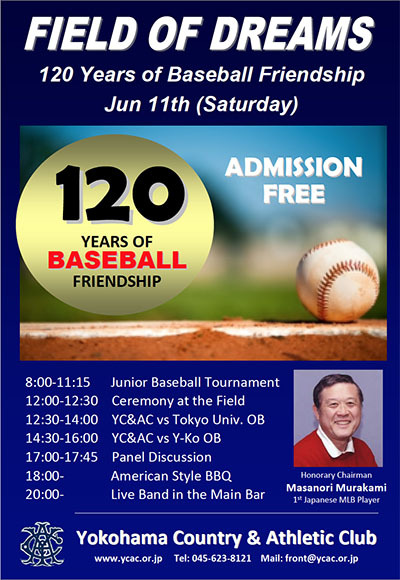 The old and prestigious Yokohama Country & Athletic Club (YC&AC) is hosting “Field of Dreams 2016” to celebrate the 120 years of Baseball Friendship at their grounds on Saturday, June 11, 2016, starting with opening ceremony at noon, 12:00, followed by baseball games, panel discussions and BBQ party. One of the 3 Japanese teams involved was the Tokyo Higher School (better known as the First Higher School or ICHIKO) which was a school to prepare students to enter the Imperial University (now the University of Tokyo). Full story entitled “LEGENDARY 1896 YC&AC vs. ICHIKO BASEBALL GAMES” by Mr. Mike Galbraith will appear on this website together with the result of the event on next Saturday in coming days.